"Working on rockets feels like the cutting edge of science... to work on a mission from beginning to end - from proposal, to launch, to data analysis and publication - is a rare opportunity for a graduate student." FOR HER PH.D. THESIS, Allison Jaynes spent two years working on the Rocket Experiment for Neutral Upwelling (RENU) before it launched from Norway's Andøya Rocket Range in early December of 2010. RENU was designed to measure the complex, underlying physics behind the phenomenon of neutral upwelling, or "satellite drag," and its relationship to aurora. Satellite drag, as the name implies, tends to slow spacecraft down and affect their orbital stability. 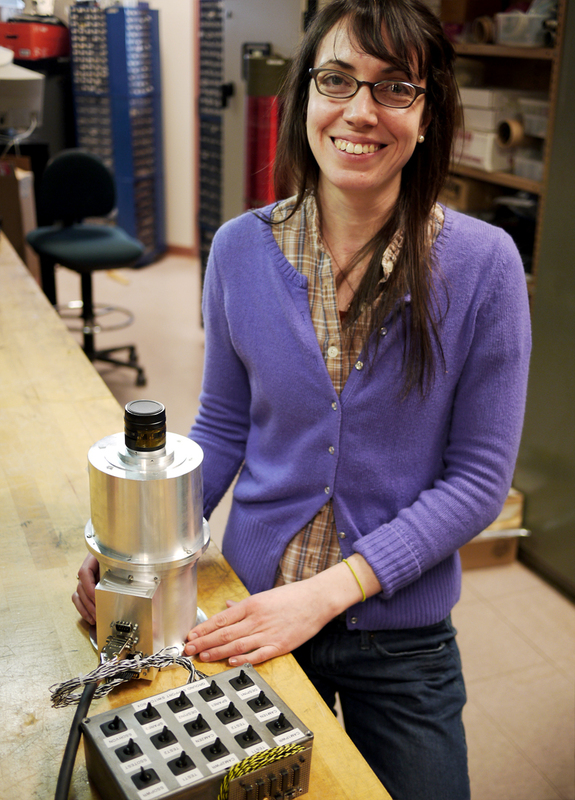 Allison Jaynes with the rocket-borne imager she redesigned for the recent MICA rocket launch. The imager, or camera, has to rotate an internal sensor at the same rate but opposite direction as the spinning rocket to get clear images of aurora. But the biggest drag that occurred with RENU was not of the neutral-upwelling kind but, rather, a failed rocket motor that within moments of liftoff doomed the mission. The 65-foot, four-stage sounding rocket went up and came quickly down, no scientific data was gathered, and Jaynes' initial thesis work likewise went up in smoke. Rocket science, however, is by nature a high-risk/high-payoff venture (and low-cost/quick-turnaround compared to satellite-based science), and the occasional rocket failure occurs. Everyone takes it in stride, and there is always a backup plan for graduate students needing to shift gears quickly and get on with their careers. In Jaynes' case, she switched from a focus on neutral upwelling – thought to be generated in part by the same solar wind particles (electrons) that create the aurora borealis or northern lights – to investigating the underlying dynamics of a quirky, poorly understood type of aurora known as pulsating aurora. 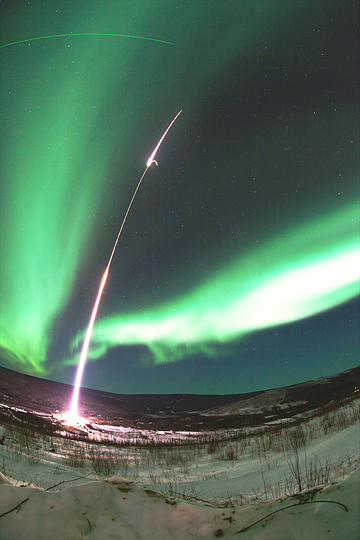 Because the physics that drives several different types of aurora and neutral upwelling is all related, Jaynes was able to be an active part of the science team for the Magnetosphere-Ionosphere Coupling in the Alfvén resonator (MICA) mission that on February 18, 2012 launched a 40-foot, two-stage sounding rocket from the Poker Flat Research Range in Fairbanks, Alaska. 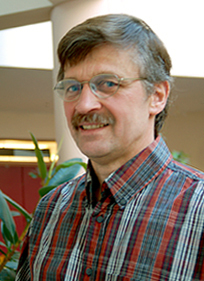 Marc Lessard of the UNH Space Science Center (SSC) is a co-investigator on the MICA mission and is also Jaynes' advisor. MICA is investigating a key physical process thought to be a driver of "discrete" aurora – the typical, well-defined band of shimmering lights about six miles thick and stretching east to west from horizon to horizon. Instruments onboard the rocket, including those built at UNH, sampled electric and magnetic fields as well as charged particles in Earth's upper atmosphere (ionosphere) that get sloshed back and forth by a specific form of electromagnetic energy known as Alfvén waves. Collaborating institutions in the mission included Cornell University, Dartmouth College, the Southwest Research Institute, and the University of Oslo (Norway). Jaynes assisted the science team with various aspects of the MICA launch due to her experience on RENU and the 2009 CASCADES II rocket mission. On RENU, Jaynes built the complex onboard auroral imager (camera) and the soda-can-sized instruments called Electron Retarding Potential Analyzers or ERPAs that gauge electron temperature – a critical measurement in any auroral science because it indicates how energy gets transferred and heats the ionosphere where most aurora occur. For the MICA mission, Jaynes taught fellow Ph.D. student Ian Cohen how to build ERPAs in the SSC Magnetosphere-Ionosphere Research Laboratory. A fisheye photo taken by an automated camera near the entrance gate at the Poker Flat Research Range in Fairbanks, Alaska. Photo by Ryuho Kataoka,Tokyo Institute of Technology. The auroral imager was a "souped-up" version based of an original model designed by former Ph.D. student Sarah Jones (now a research astrophysicist at NASA's Goddard Space Flight Center) and SSC engineer Paul Riley for the 2007 Rocket Observations of Pulsating Aurora, or ROPA, mission for which Lessard was principal investigator. The imager's complexity is based on the fact that rocket payloads spin as they fly and thus the camera must "de-spin" the imagery at the same rate as the rocket, but in the opposite direction. Says Jaynes, "I changed the field of view, added a baffle to block stray light and changed the mechanical and electrical design to suit different parameters." As part of her focus on pulsating aurora, during the MICA launch Jaynes and a colleague discussed video footage of aurora he had taken and that she hopes to analyze and include in her thesis. For the footage, which captured both pulsating and diffuse aurora (the latter being fainter, fuzzier, and less colorful than discrete aurora), filters were used to capture just the green and blue wavelengths of the visible light band. This produced two movies looking at the exact same sky at the same time – one showing just green, other just blue. Explains Jaynes, "The different wavelengths represent different energies of electrons and, theoretically, different energy electrons come from different parts of the magnetosphere. So if we can distinguish those populations we should be able to pinpoint the origin of those particles." The upshot of all this, and the bottom line of all auroral physics, is gaining insight into what's happening in these regions of the magnetosphere and how that connects the ionosphere. "That connection is the important thing," notes Lessard. "Understanding how the ionosphere participates in providing the downward electrical currents is a critical component of understanding magnetosphere-ionosphere coupling." Pulsating aurora, unlike the spectacular, curtain-like discrete variety, are a much more subtle type that seem to blink on and off in large round patches roughly three to six miles thick. Pulsating aurora occur after the aurora borealis and are therefore often missed by watchers who think the show is over and head back indoors. Despite their small size, transient nature, and distance far above the surface of the Earth, pulsating aurora pack an energetic punch, and the power behind them is a mystery scientists would like to solve. It has been theorized that they get their energy from the Van Allen radiation belts far from Earth, which is unlike typical aurora displays that are driven by processes just a few hundred miles above the atmosphere. "Right now I'm looking at the source region for the electrons that energize pulsating aurora," Jaynes says. "It's always been surmised to be in the equatorial magnetosphere and we now have satellites with particle detectors that can show these electrons are indeed coming from the equator region, streaming along the magnetic field lines and ending up as pulsating aurora." Scientists now know that pulsating aurora turn on and off due to the modulation of particles in the equatorial magnetosphere, but they don't always know if what drives the different auroral processes is something local in the ionosphere or further away in the magnetosphere. Posits Jaynes, "The details of auroral forms are tricky. Are they phenomena involving the currents in the ionosphere or is it something way outside in the magnetosphere? That's information we just don't have a very good handle on right now." A two-stage Terrier-Black Brant rocket arced through aurora 200 miles above Earth during the MICA mission. Stage one of the rocket has just separated and is seen falling back to Earth. Photo by Lee Wingfield, NASA Wallops. But one of the best means of getting a better handle on the physical phenomena driving aurora – pulsating and otherwise – is to send an instrument-laden rocket right into the thick of things to directly measure electric and magnetic fields and the temperature and density of the electrons that fuel the process. The 2007 ROPA mission was dedicated to investigating pulsating aurora. And unlike MICA, which "simply" arced a two-stage rocket through aurora, the experiment was a complex, multifaceted rocket launch that involved a main instrument cluster – the payload – and three sub-payloads, which separated early after the rocket cleared the upper atmosphere at an altitude of 143 miles. Two of the sub-payloads had their own rocket motors, propelling them away from the main payload where they obtained spatially separated measurements of the pulsating aurora. The ROPA team also used the rocket to measure electrical current flow related to pulsating auroras and to produce visual images from within the pulsating aurora. 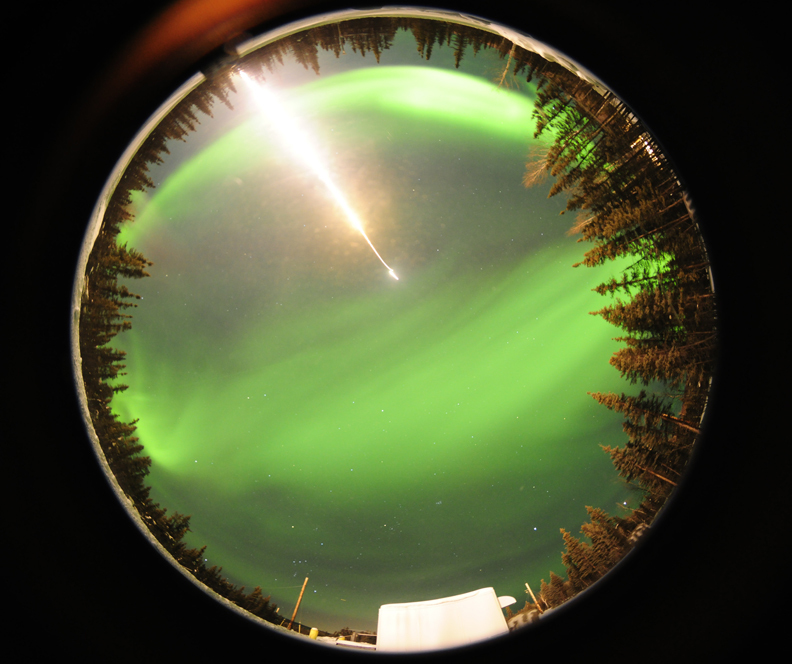 Whereas ROPA studied the energies and velocities of pulsating aurora particles near Earth using a sounding rocket, Jaynes' current research relies on particle detectors onboard satellites that are showing for the first time that particles at the equatorial magnetosphere far from Earth are fluctuating with the same frequency as pulsating aurora back near Earth. "But pulsating aurora are still a very little studied and poorly understood phenomenon since where these particles originate from – the equatorial magnetosphere – is not the same as what or why," says Jaynes. 'What causes these fluctuations out in that part of space? Why do they interact with these electrons so consistently? We've recorded one instance where these particles begin to fluctuate, but we still don't have a handle on the intricacies of the whole system, we're just getting started on this." Indeed, notes Lessard, "Why do we care about aurora? First, it's okay just to be curious and investigate aurora for the sake of gaining a better understanding of how a part of the universe works. But on a smaller scale, understanding different kinds of aurora and how they're caused tells us everything about what's happening upstairs, right above our heads." 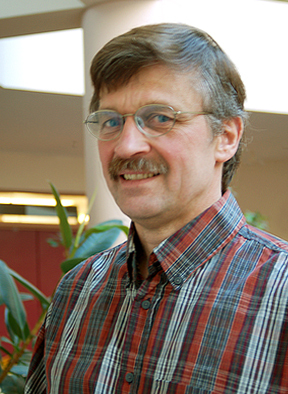 SSC associate professor Marc Lessard. In the case of MICA, the high-risk/high payoff aspect of rocket science appears to have paid off. After waiting days for the perfect, potentially fleeting auroral conditions to present themselves, the moment arrived and the two-stage rocket blasted right through a six-mile-wide aurora arc within minutes of its formation. A burst of particle data lit up the instrument panels alerting the scientists that they had hit the mark. Steven Powell, MICA principal investigator from Cornell University, notes that the initial readings via what are called "stripchart" recordings indicate excellent measurements were made of the electric fields, magnetic fields, and charged particles (electrons and ions), associated with the aurora. Says Powell, "These stripchart recordings are much like a patient's EKG in a hospital and give us a quick, real-time glimpse of our data so we know our instruments worked properly and the data quality are excellent." That data, Powell notes, will be analyzed by graduate students and scientific staff and, eventually, results will be presented at scientific conferences and published in peer reviewed scientific journals. Even though her scientific focus was different from that of MICA's, any rocket launch is, says Jaynes, "an immersion into the science. For MICA, the process of listening to and talking with the scientists – the best brains in the business – night after night, watching things change and reading the instruments in terms of atmospheric conditions and the potential to launch, it was all invaluable." Jaynes is grateful to have had a NH Space Grant Fellowship and a NASA Graduate Student Researchers Program (GSRP) fellowship (2009 through 2011) that have helped make her work possible. In addition to providing a stipend, tuition, and travel to conferences, through GSRP she has been able to work with advisor Thomas Moore (a 1970 UNH graduate) at NASA Goddard and make contacts with NASA researchers for potential future endeavors. Jaynes hopes to remain in the rocket business once she graduates this coming fall. "Working on rockets feels like the cutting edge of science. The experience is so unique. To be able to work on a mission from beginning to end - from proposal stage, to launch, to data analysis and publication - is a rare opportunity for a graduate student," Jaynes says.